This intersection of 13th and Duboce (Duboce is going west from Mission at left center of image) was obliterated by the Central Freeway less than a decade after this 1951 photo was taken, and today is under the curving ramp as it heads toward Market Street. On October 17, 1989, the magnitude 6.9 Loma Prieta earthquake shook down several Bay Area freeways. The Cypress Freeway, a double-deck, 1960s-era freeway in the working-class neighborhood of West Oak-land, collapsed, and forty-two people were killed. A section of the upper deck of the Bay Bridge collapsed onto the lower deck, killing one motorist. In San Francisco the Embarcadero Freeway and sections of I-280 in Mission Bay were damaged, and in Hayes Valley the Central Freeway was shut down. It took longer—ten years—to determine the fate of the Central Freeway. After the quake, parts of the freeway that were beyond repair were removed, but other segments reopened. An acrimonious debate included ballot initiatives in 1997, 1998, and 1999 and was resolved with only partial removal and replacement with a short surface boulevard. The decade-long debate about removing the Central Freeway represented a cautiously hopeful juncture in the politics of mobility in San Francisco. It signified a political maturing of progressive transportation advocacy and also a subtle rapprochement with neoliberal real estate and development interests, who shared in promoting reurbanization of housing and voiced some of the principles of livability. The city’s conservatives were less optimistic. They opposed removing the freeway and took the matter to the ballot. Their concern was the loss of easy freeway access to the Fell–Oak and Franklin–Gough one-way couplets which linked to the west and north sides of the city. Caltrans also wanted to rebuild the Central Freeway because, like 19th Avenue on the west side, it was a vital, albeit incomplete, regional link connecting the Bay Area freeway network to the Golden Gate Bridge. But the end result, partial removal, was an incremental nudge toward livability in Hayes Valley, where the freeway once ran overhead. This outcome is far from perfect, however, and traffic remains a major problem. The removal of the Central Freeway took place in Hayes Valley, in the center of the city just west of City Hall and one of several Victorian-era neighborhoods in the original alignment of the freeway (map 1, below). After the earthquake and firestorm of 1906, which burned down much of San Francisco, Hayes Valley densified because it was largely spared by the fire and had solid housing that could be subdivided. In the 1920s and 1930s Hayes Valley was a choice area for apartment development because of its proximity to downtown. With its streetcars and dense, mixed-use, walkable neighborhoods, the built environment of Hayes Valley mirrored much of what is promoted in livability discourse today. 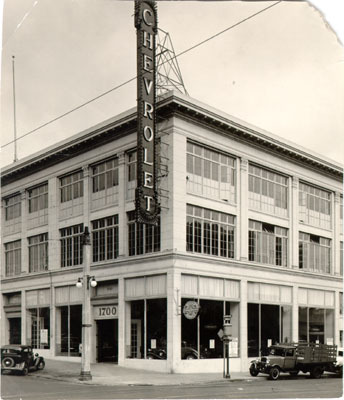 Because of its central location Hayes Valley was the confluence of major automobile routes through the city. After the earthquake in 1906, Van Ness Avenue (present-day U.S. Highway 101) was reconfigured as a key north–south automobile route that bypassed the west flank of downtown. In the 1930s Van Ness Avenue was extended south of Market Street and penetrated the incongruent grid that now complicates movement through the city. Later, Gough Street, albeit at a different angle, also penetrated the incongruences. Parts of Hayes Valley were transformed into a bypass for cars and a de facto node in the regional highway system. Many new businesses catered to automobiles, including automobile dealerships, service stations, and automobile-oriented retail and commercial establishments. The juxtaposition of dense housing and a thruway for automobiles is a quandary residents and planners have spent decades trying to solve and reflects the paradoxical mobility stalemate described above. During the Second World War, African Americans moved into the area, and Hayes Valley experienced white flight and declining maintenance of the housing stock. After the war, planning was biased toward incremental conversion of the area into a major automobile thruway. By the mid-1950s, streets like Fell, Oak, Franklin, and Gough were converted into major one-way couplets, while city planners considered the neighborhood blighted, pathologically disorganized, and in need of “social surgery.”(4) Freeways could do more good than harm, the logic followed, and so the city and state agreed on building the Central Freeway in Hayes Valley, with the corollary network of widened one-way couplets also radiating outward. The alignment of the Central Freeway paralleled Van Ness Avenue, linking the Golden Gate Bridge to the Bay Bridge and to the Bayshore Freeway to the south. Like the Western Freeway, the Central Freeway was a strategic regional highway link. In 1959 the Central Freeway was completed from the junction of the Bay Bridge Viaduct and through Hayes Valley north to Turk Street, but the remainder of the route was canceled during the freeway revolts. Hayes Valley was considered marginal and had little voice in the freeway debates, but the neighborhoods to the north, including Pacific Heights and the Marina District, were active in the revolts and objected to the northern extension of the Central Freeway. This meant that freeway traffic was delivered to the surface streets in Hayes Valley. As on 19th Avenue on the west side of the city, this created an intractable traffic mess, making Hayes Valley a less desirable part of the city. The Central Freeway as it swoops towards its dead-end at Franklin and Gough and Turk Streets, August 2, 1965. Adding to this, in 1955 traffic engineers established the Hayes–Fell–Oak Z configuration (see map 1 below). Briefly, the Z configuration shifts the Fell and Oak Streets one-way couplet north by one block to Hayes Street, utilizing the perpendicular Franklin and Gough one-way couplets. 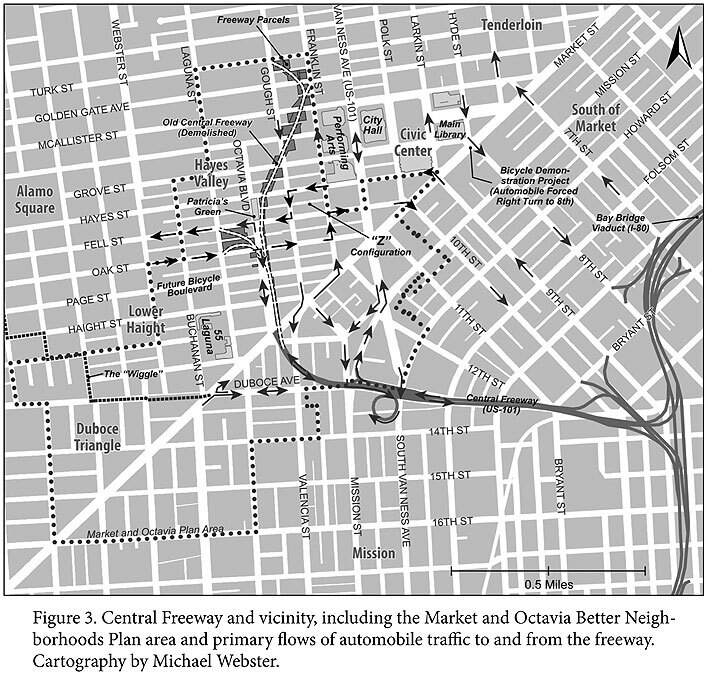 The Z jog effectively aligned the east–west traffic flow to the South of Market grid, enabling large volumes of traffic to cross Market Street on the 9th and 10th Street one-way couplets, which also fed the 101 Freeway to the south. Additionally, the shifting of the couplet northward to Hayes Street enabled elimination of the five-point intersection at Oak Street, Van Ness Avenue, and Market Streets. The Z configuration solidified Hayes Valley as a conduit for cars. In 1966, as noted earlier, San Francisco’s freeway revolt finally ended with the cancellation of the Panhandle Freeway, which would have extended from the Central Freeway westward along the Fell–Oak axis. Touchdown ramps built directly to Fell and Oak Streets became permanent, feeding the freeway to the cross-town one-way couplet. By the late sixties more than 150,000 vehicles per day were traveling through Hayes Valley. 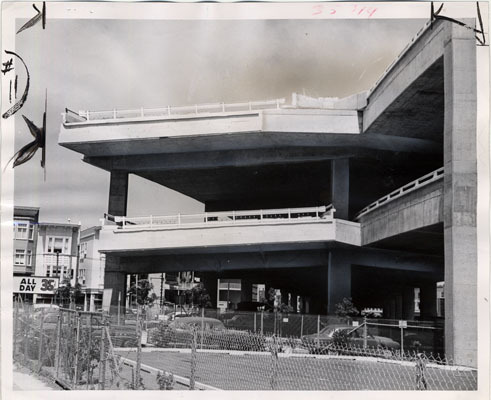 (5) The intense traffic, wide one-way streets, and confusing Z jog led to the further decline of Hayes Valley, and by the 1970s the underside of the Central Freeway was notorious for prostitution and drug dealing. Despite the neighborhood’s historic decline, parts of Hayes Valley underwent limited residential revitalization in the 1970s. Gentrification spilled into parts of Hayes Valley from neighborhoods further to the west, such as the Castro and Duboce Triangle. In the 1980s the opening of Davies Symphony Hall stimulated small business and new restaurants along Hayes Street. This gradual revitalization lay the foundation for organized advocacy for freeway removal after the earthquake in 1989. New merchants were particularly fond of the idea of day-lighting Hayes Street, and many residents experienced what it was like to see traffic density plummet, as it did immediately after the earthquake. They did not wish for it to return. The idea of removing the freeway was complicated by the debate over the Embarcadero Freeway. In 1991 Mayor Art Agnos, a progressive, faced a political backlash from merchant organizations in Chinatown that believed the Embarcadero should have been rebuilt to sustain freeway access to Chinatown. (6) They charged that Agnos acted too hastily and without their input. While many of the merchants lived outside of Chinatown, prior to the earthquake they drove into Chinatown via the ramps from the Embarcadero Freeway, which also fed automobile-oriented tourists into a five-hundred-stall parking garage. The Chinatown backlash slowed early political momentum for removing the Central Freeway. Agnos lost his reelection bid in November 1991, in part owing to political organizing against him from Chinatown. For progressives, the second freeway revolt had political costs. The post-earthquake traffic was distributed unevenly, and some parts of Hayes Valley were overwhelmed. For example, the newly truncated configuration increased traffic by 70 percent on the Fell and Oak couplet as many cars that once proceeded north to the Franklin and Gough couplet now exited there. (8) There were rumblings of dissent from that section of Hayes Valley. Moreover, everyone in the neighborhood saw the benefit of freeway removal over Hayes Street, and the idea of further removal spread among the local residents. The Board of Supervisors established a citizens’ advisory task force to advise the board on what to do about the remaining segments of the freeway, and the San Francisco Planning Department (SFPD) investigated the potential for urban infill on the former freeway parcels north of Hayes Street. Members of the task force called for the remaining freeway to be torn down. Yet by the time the nascent task force made its recommendation, the political pendulum of the city had swung in a more conservative direction, and the recommendation was ignored. Agnos lost the mayor’s race in 1991 to the conservative Frank Jordan, a Republican who ran on a law-and-order platform and who was the former police chief of San Francisco. (9) To Jordan, the Central Freeway was an an-noyance and a political third rail. His constituency was on the west side of the city, and so he did not want to see it removed, but his lack of political capital (he was considered dysfunctional and bumbling) meant he could not push the rebuilding of the freeway aggressively. Doing nothing became the temporary default position—a mobility stalemate. The hope was that Caltrans would sidestep local political debate and simply rebuild the freeway. However, state law limited Caltrans’s ability to decide the ultimate fate of the Central Freeway. This was significant because Caltrans, viewing the freeway as a strategic regional roadway, would have likely rebuilt the entire damaged freeway regardless of local objections. Instead, state law obliged Caltrans to cooperate with the city and explore various alternatives to fully rebuilding the freeway. This process required both public input and environmental evaluation of air and noise and spelled out that Caltrans could proceed on the Central Freeway project only if the city approved. In the early 1990s it became apparent that the question of what to do about the Central Freeway would become a prolonged political struggle. The delay allowed more time for Hayes Valley residents and merchants to organize and for progressive transportation ideas to inform the debate. Two themes characterized progressive organizing around freeway removal in the 1990s. First, the demographics of the area changed as a result of gentrification. Hayes Valley was being transformed by a new stratum of well-educated middle-class residents from outside of the neighborhood who were seeking inexpensive urban housing or were willing to invest some sweat in renovating properties. Many of these new residents were renters, not homeowners, and many of the homeowners were not speculators. As we shall see in subsequent chapters, later waves of gentrification focused more on speculation and commodification of neighborhoods, reflecting a pronounced neoliberal perspective on mobility rather than a progressive one. (10) Meanwhile, accompanying the first wave were small businesses that lined Hayes Street with arts and crafts, clothing, and other shops. Many of the new residents and business owners self-organized to promote removal. Second, a newly invigorated, citywide progressive mobility discourse, led in part by a vocal bicycle advocacy movement, was gaining traction and by the mid-to-late 1990s had achieved political parity with other progressive causes. Most pronounced in the city’s Victorian belt, this new progressive discourse about livability, urbanism, and mobility strengthened the arguments of Hayes Valley residents who were seeking freeway removal. The Hayes Valley neighborhood activists who eventually took down the freeway first began to organize around the prostitution and drug dealing taking place underneath the freeway. (11) Where the freeway crossed over Haight, Page, and Waller Streets two small groups coalesced in early 1994 and began to develop a leadership structure with officers, committees, and regular meetings. Significantly, many of these Hayes Valley residents did not secede from their space in response to the public safety concerns. Instead, the activists were eager to develop solutions that were realistic and believed that simply pushing prostitution and crime out of the neighborhood would not suffice. They held safety outreach events for prostitutes, worked with the police in identifying pimps, and lobbied for community policing. The group advocated that prostitutes receive treatment and reform rather than jail. While organizing around public safety, Caltrans put forth a plan for a new replacement freeway viaduct from Mission Street to the remaining Fell and Oak Street ramps. In a nod to Hayes Valley, the Board of Super-visors adopted a resolution urging Caltrans to delay the retrofit process until other alternatives were studied. The board then appointed several Hayes Valley residents to a newly reconstituted Central Freeway Citizens’ Advisory Task Force (CFCTF), which became the formal platform for shaping local rethinking of the freeway. Members of the CFCTF asked that an option of complete freeway removal be included among the alternatives Caltrans would study. The CFCTF also suggested that if there was to be a rebuilding, a new freeway touchdown ramp should be located somewhere south of Market Street rather than at the Fell and Oak Street couplet. The CFCTF met frequently in 1995 and 1996 and held several citywide public meetings. It drafted guidelines for how it would approach the free-way question, including many of the tenets of livability, such as promoting the city’s transit-first policy and emphasizing walkability and affordable housing. The CFCTF guidelines also had a clause stating that no single neighborhood should absorb the burden of freeway traffic. These guide-lines hinted of progressive values, including a strong sense that government should ensure environmental and social justice as part of the public interest. Hayes Valley’s organizing around freeway removal shared in the broader zeitgeist of rethinking mobility in San Francisco, the Bay Area, and nationally. During the mid-1990s congestion and sprawl became leading political issues in the Bay Area. (13) Congestion and sprawl were also national concerns. From Atlanta to Portland and across the nation new urbanist and smart-growth advocates organized to offer an alternative vision of cities that invoked much of the livability discourse. (14) Even in Southern California, long regarded as a region where the car was idolized, citizens bemoaned smog and protested the last segment of I-710 through Pasadena. (15) Neighborhood activists succeeded in halting a short segment of freeway that would have split cohesive neighborhoods east of downtown Los Angeles. In suburban San Mateo County, the so-called Devil’s Slide highway and tunnel controversy fed into the Central Freeway debate and suggested to Hayes Valley activists that Caltrans bullied communities into accepting freeways. (18) In this case Caltrans was found to be withholding evidence from opponents of an inland freeway bypass, while diluting evidence of the benefits of a tunnel option along the San Mateo County coastline. Eventually citizen activists put the tunnel option on the ballot and won. The high-profile Devil’s Slide controversy reminded many of the long-standing tension between Caltrans engineers and local control of transportation, which in San Francisco went as far back as the first freeway revolts in the 1950s and 1960s. In San Francisco, Critical Mass bicycle rides challenged not only automobility but also capitalism and compelled many to rethink the role of automobility in cities. Initiated in September 1991, Critical Mass had generally been a relaxed affair until the mid-1990s, when it started to get popular, larger, and more disruptive to automobile traffic. (19) Angry motorists complained to local politicians, and the police began to steer Critical Mass to streets where there would be less of a traffic impact. Bicyclists protested, and a violent upheaval followed in the summer of 1997. The crackdown on Critical Mass got ample media attention, and the bicycle protest movement became conflated with the anti-freeway movement, no doubt because the two groups were not only sympathetic but shared participants. Notably, the controversy over Critical Mass attracted even more cyclists to subsequent rides, with thousands of participants on warm summer evenings in the late 1990s, just as the Central Freeway debate would come to a crescendo. In this broader context Hayes Valley activists formed the Association to Simplify Traffic and Abate Congestion (ASTAC). 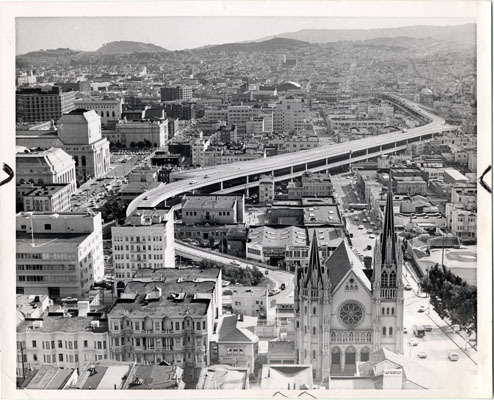 ASTAC tapped into the broader politics of mobility of San Francisco’s Victorian Belt and used political connections to lobby for complete or near-complete removal of the Central Freeway north and south of Market Street. ASTAC’s members had considerable linkages to progressive advocates outside of the neighborhood, including the Sierra Club, San Francisco Tomorrow, the San Francisco Bicycle Coalition (SFBC), the Harvey Milk Club, the American Institute of Architects and Urban Ecology. The group also had connections and support from merchants in Hayes Valley and other nearby neighborhood organizations. ASTAC activists proposed to fully remove the entire length of the free-way and suggested not replacing it with anything. They showed their removal proposal to various community groups and organizations around the city and got a largely positive response, implying that this option should at least get a fair hearing. Yet the full-removal proposal was dismissed out-right by the consultant hired by Caltrans and the city to study the options. City traffic engineers and the city’s consultants literally laughed at the Hayes Valley activists. The city therefore never had the information or data to adequately consider a full-removal alternative. A fair hearing on the full-removal alternative did not happen, and this immediately narrowed the politics of possibilities. While progressive transportation advocates such as ASTAC could not get everything they wanted—full removal with no replacement surface boulevard funneling cars through their neighborhood—they were able to contribute to removing part of the freeway. Their main contribution was to achieve a political redefinition of the possibilities away from the other extreme of fully rebuilding the freeway. But the struggle for freeway removal was far from over. Complicating progressive visions was a conservative movement to fully rebuild the freeway.